Broc en Stock is the first game that a friend and I made using Unity 4.x (so a while ago). I've imported the files in Unity 5.4 and decided to upload it on itchio. 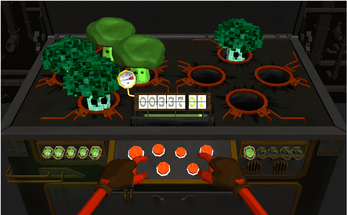 This game looks a lot like a whac-a-mole but instead of hitting moles, you burn broccoli. If you don't have a controller, the keys are zqsd and arrows which is not covenient for english keyboard sorry). The score display can break, but at the end of your game you will have your true score.